Narcissistic Personality Disorder Can the Narcissist Get Better? Can the Narcissist Get Better? Pathological narcissism cannot be cured, but the narcissist can “re-parent” himself and modify his more egregious behaviours. I love him. I cannot leave him like that. He is like a crippled small child. My heart goes out to him. Will he ever get better? Can he ever get better? The Narcissistic Personality Disorder is a systemic, all-pervasive condition, very much like pregnancy: either you have it or you don't. Once you have it, you have it day and night, it is an inseparable part of the personality, a recurrent set of behavior patterns. Recent research shows that there is a condition which might be called "Transient or Temporary or Short Term Narcissism" as opposed to the full-fledged Narcissistic Personality Disorder, (NPD). (Ronningstam, 1996). The phenomenon of "Reactive Narcissistic Regression" or "Acquired Situational Narcissism" is well known: people regress to a transient narcissistic phase in reaction to a major life crisis which threatens their mental composure. There are narcissistic touches in every personality and in this sense, all of us are narcissists to a certain extent. But this is a far cry from the NPD pathology. One bit of good news: no one knows why, but, in certain, rare, cases, with age (in one's forties), the disorder - especially its antisocial manifestations - seems to decay and, finally, stay on in the form of a subdued mutation of itself. This does not universally occur, though. Should a partner stay on with a narcissist in the hope that his disorder will be ameliorated by ripe old age? This is a matter of value judgment, preferences, priorities, background, emotions and a host of other "non-scientific" matters. There is no one "correct" answer. It would seem that the only valid criterion is the partner's well being. If he or she feels bad in a relationship (and no amount of self-help or of professional help make a difference) – then looking for the exit sounds like a viable and healthy strategy. Having a relationship with a narcissist sometimes borders on co-dependence, or even symbiosis. Moreover, the narcissist is a consummate emotional manipulator and extortionist. True, in some cases, there is real threat to his mental stability. Even "demonstrative" (failed) suicide cannot be ruled out in the repertory of narcissistic reactions to abandonment. And even a modest amount of residual love harboured by the narcissist's partner makes the separation very difficult for him or her. The transition from over-valuation (reserved for potential and actual Sources of Narcissistic Supply) to devaluation (reserved for other mortals) is painfully and shockingly swift. Even partners who previously prayed for the narcissist to depart and leave them alone are anguished. The partner is the narcissist's pusher and the drug that she is purveying (Narcissistic Supply) is potent because it sustains the narcissist's very essence (his False Self). Here lies the partner's salvation. An advice: if you wish to sever your relationship with the Narcissist, stop providing him with what he needs. Do not adore, admire, approve, applaud, or confirm anything that he does or says. Pay him no attention - or, if you do, constantly disagree with his views, reduce him to size, compare him to others, tell him that he is not unique, criticize him, make suggestions, offer help. In short, deprive him of that illusion which holds his personality together. But can he get better, you insist. Pathological narcissism is very hard to treat successfully. NPD has been recognized as a distinct mental disorder a little more than two decades ago. There is no one who can honestly claim expertise or even in-depth understanding of this complex condition. So, no one knows whether therapy works. What is known is that therapists find narcissists repulsive, overbearing and unnerving. It is also known that narcissists try to co-opt, play-down or even humiliate the therapist. a. Know and accept thyself. This is what you are. You are highly intelligent. You are very inquisitive. You are a narcissist. These are facts. Narcissism is an adaptive mechanism. It is dysfunctional – but it saves you from a LOT MORE dysfunction. Make a list: what does it mean to be a narcissist in your specific case? What are your typical behavior patterns? Which types of behavior are counterproductive, irritating, self-defeating or self-destructive? Which are productive, constructive and should be enhanced, their pathological origin notwithstanding? Decide to suppress the first and to promote the latter. b. Construct lists of self-punishments, negative feedback and negative reinforcements. Penalize yourself when you exhibit one of the behaviors in the first list. Make a list of prizes, little indulgences, positive feedbacks and positive reinforcements. Use them to reward yourself when you display a behavior of the second kind. c. Keep doing this with the express intent of conditioning yourself. Try to be objective, predictable and just in the administration of both punishments and rewards, positive and negative reinforcements and feedback. Learn to trust your "inner court". Constrain the sadistic, immature and ideal parts of your personality (known as "Superego" in psychoanalytic parlance) by applying a uniform and consistent set of rules. d. Once sufficiently conditioned, monitor yourself incessantly. Narcissism is sneaky and it possesses all your resources because it is you. Your disorder is intelligent because you are. Beware and never lose control. With time this onerous regime will become a second habit and supplant the narcissistic (pathological) superstructure. You might have noticed that all the above can be amply summed by suggesting to you to become your own parent. This is what parents do and the process is called "education" or "socialization". The heart of the beast is the inability of the narcissist to distinguish true from false, posing from being, Narcissistic Supply from genuine relationships and compulsive drives from true interests and avocations in his life. Narcissism is about deceit. It blurs the distinction between authentic actions, true motives, real desires, original emotions – and the malignant forms that are the attributes of narcissism. Narcissists are no longer capable of knowing themselves. Terrified by their internal apparitions, paralyzed by their lack of authenticity, suppressed by the weight of their repressed emotions – they occupy a hall of mirrors. Their curious, vibrant, optimistic True Self is dead. The False Self is false, the narcissist's permanent diet of reflections obscures the real world. How can the narcissist ever love, he who repeatedly devours meaningful others and transforms them into meaningless aliens? The answer is the relentless but compassionate and just application of discipline in the service of pursuing clear and realistic targets. The narcissist is the product of unjust, capricious and cruel treatment. He is the finished product off a production line of self-recrimination, guilt and fear. He needs to take an antidote to counter the narcissistic poison. But, unfortunately, there is no drug which ameliorates pathological narcissism. Confronting one's parents and childhood is a good idea if the narcissist feels that he is ready for it. Can he take it? Can he cope with rediscovered truths, however painful? The narcissist must be careful. This is playing with fire. But if he feels confident that there is nothing that can be revealed to him in such a confrontation that he cannot withstand – it is a good and wise move. My advice to the narcissist would then be: just dedicate a lot of time to rehearsing the encounter and define well what is it exactly that you want to ask. Do not turn this into a monodrama, group dynamics or trial. Ask in order to be enlightened. Don't try to prove anything, to vindicate, to take revenge, to win, to exculpate. Talk to them as you would with yourself. Do not try to sound professional, mature, intelligent, knowledgeable and distanced. There is no "problem to solve" – just a condition to adjust yourself to. Think about it as diabetes. 1. The narcissist should take life in general and himself, in particular, much less seriously. Being immersed in one's self and in one's condition is never the right recipe to functionality, let alone happiness. The world is a comic, absurd place. It is indeed a theatre to be enjoyed. It is full of colors and smells and sounds to be treasured and cherished. It is varied and it accommodates and tolerates everyone and everything, even narcissists. 2. 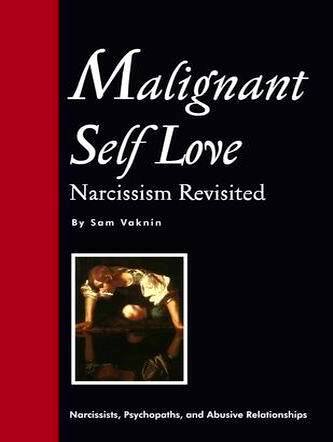 The narcissist should regard his condition as an asset. I am a narcissist, so I write about it. My advice to the narcissist would be: ask yourself what can you do with it? In Chinese the ideogram for "crisis" and "opportunity" is one and the same. Why don't you transform the curse in your life – into a blessing in other people's lives? Why don't you tell them your story, warn them, teach them how to avoid the same pitfalls, how to cope with the damage? Why don't you do all this in a more institutionalized manner? For instance, you can start a discussion group on the internet. You can establish "Narcissists Anonymous" in some community shelter. You can open a correspondence network, a help centre for men in your condition, for women abused by narcissists ... the possibilities are endless. And it will instill in you a regained sense of self-worth, a purpose, self-confidence and reassurance. It is only by helping others that we can help ourselves. 3. It is easy for the narcissist to think about Pathological Narcissism as the source of all that is evil and wrong in his life. Narcissism is a catchall phrase, a conceptual scapegoat, an evil seed. It conveniently encapsulates the predicament of the narcissist. It introduces logic and causal relations into his baffled, tumultuous world. But this is a trap. The human psyche is too complex to be captured by a single, all-encompassing explanation, however convincing. The road to self-help and self-betterment passes through numerous junctions and stations. Narcissism is the first and the foremost. But there are many other elements in the complex dynamics that is the soul of the narcissist. The narcissist should take responsibility for his life and not relegate it to some hitherto rather obscure psychodynamic concept. This is the first and most important step on the way to healing. Can a Narcissist Help himself ?